Copper-nickel alloys are used in systems and splash zone sheathing on offshore oil and gas platforms and on floating production, storage, and offloading vessels (FPSOs). They are excellent materials for these harsh environments because they have good resistance to corrosion, reduced levels of macrofouling, are readily fabricated and can be welded directly to steel. Offshore oil and gas platforms store and transport seawater, cooling water and fire water. In seawater systems, copper-nickel has enjoyed extensive use. Piping is typically fabricated with 90-10 Cu-Ni. Compatible valves and pumps are typically fabricated with nickel-aluminum bronze. In cooling water systems, 90-10 Cu-Ni can be used in seawater piping as long as velocity limits are not exceeded. Fire mains are often constructed with 90-10 Cu-Ni. Fittings for fire systems are available in copper-nickel as well. The use of copper alloys in seawater systems, cooling water systems, and fire water systems of offshore oil and gas processing facilities are summarized here. 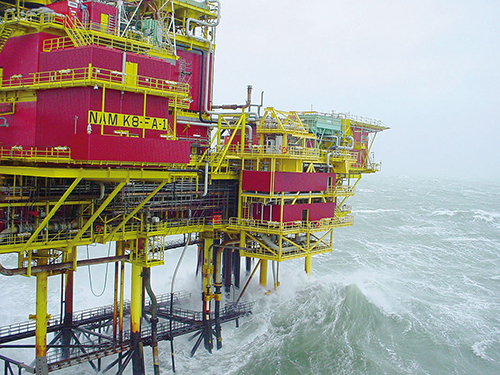 Splash Zone Sheathing on Oil and Gas Platforms: Alloys of copper and nickel have been used for many years as a protective splash zone sheathing on risers and legs of offshore oil and gas platforms. When steel is used in the splash zone, the corrosive and erosive actions of aerated sea spray, waves and tidal action can cause high corrosion rates (generally in the 0.5-1.5 mm/yr range). Corrosion rates increase with temperature and can reach as much as 8 mm/yr on hot riser pipes made from steel. Cathodic protection is not effective because of the lack of continuous contact with seawater (i.e., the electrolyte). 90-10 alloys are proven for straight corrosion resistance or when insulated from less noble metals for resistance to corrosion and biofouling. Sheathing is normally applied as welded sheets or as granules or wire in a neoprene or resin composite. When copper-nickel granules are bonded into neoprene sheets for splash zone and biofouling protection, only 30% of the surface may need to be covered by the granules for surface protection. 90-10 Cu-Ni alloy has had an excellent track record since 1985 for protection against splash zone corrosion in the Morecambe Gas Field, a major gas field in the Irish Sea. A 4 mm-thick sheathing was directly welded to steel legs on production and accommodation platforms, drill platforms and a flare stack. Minor amounts of fouling that do form are easily removed with a light scraping action, even when under cathodic protection. A review of offshore sheathing, including corrosion, fouling protection, attachment methods, and cost analyses, is provided. An FPSO is a floating production, storage and offloading vessel. These vessels are used in offshore oil fields as an alternative to fixed, tension leg or semi-submersible production platforms. They are of particular benefit in deepwater areas where fixed platforms cannot be used. An FPSO has a ship's hull, held in location by a mooring system. For many, this is a single-point mooring, allowing the vessel to rotate around a vertical axis to always face into the weather. Well fluid moves from the sea bed to the vessel through a fluid transfer system and is then processed by equipment mounted on the deck. Produced oil is stored in tanks in the hull, awaiting periodic transfer to a shuttle tanker to transfer to shore. FPSOs can be new build or a conversion of an existing tanker to allow oil production and storage systems. Systems involving copper-nickel can be similar to other shipping vessels but in addition will have extensive fire fighting and oil processing equipment. For information about copper-nickels and their applications, see Shipbuilding and Repair and Offshore Oil and Gas Processing sections. Alloys of Copper and Nickel for Splash Zone Sheathing of Marine Structures, Michels, Harold T. & Powell, Carol A., 2002 , Copper Development Association Inc., . Copper-Nickel Alloys Used in Shipbuilding and Repair, . Copper-Nickel Sheathing and Inserts on Boat Landing Systems to Avoid Marine Growth: Safer Landings - a low cost solution, KME Mtl. Group Ltd., . Cu-Ni Sheathing of Offshore Platform Legs and Risers, Powell, Carol; Consultant to CDA, 2002 , . OSNA®-10 Copper-Nickel Sheathing on Boatlandings, Brochure, KME Germany GmbH & Co. KG, . OSNA®-10 Copper-Nickel Sheathing on Offshore Structures, Brochure, KME Germany GmbH & Co. KG , . Review of Copper-Nickel Alloy Sheathing of Ship Hulls and Offshore Structures, Peters, Dale T., 1992 , Copper Development Association Seminar Technical Report 7044-1919. The Application of Copper Nickel Alloys in Marine Systems . Seawater System Design, CDA, . Use Of Copper Alloys In Oil And Gas Process Facilities, .